This week's show included songs by Queen, The Pretenders and Peter Frampton. "Howdy doody, welcome once again to the Joe Elliott show right here on the wonderful Planet Rock. And where am I this week?. I am in Los Angeles because I've just been doing a couple of days promo. Promoting this latest Def Leppard tour which starts in May and doesn't finish all the way into what 18th of December at Wembley Arena I believe it is. Unless more shows get added, which is always a possibility. We have got some fantastic music for you tonight. In fact there's a lot of new stuff in the show tonight. But we're gonna start off with something weird and wacky from way back in 1977. Originally for a BBC session broadcast, this is the mighty Queen." "Well I have to confess I've actually had that on bootleg for many, many years, but now it is officially available on the recently released 40th anniversary version of the album News Of The World. That is Queen with the live studio version recorded at the BBC Maida Vale studios back in 1977 of the song We Will Rock You." "Now the aforementioned Def Leppard tour that starts on the 21st May in Hartford, Connecticut and finishes 18th of December at Wembley Arena. We've got some great bands playing with us all the way through the States it's Journey. In Great Britain and Ireland it is Cheap Trick, but also on the American tour. Some of the stadiums we're playing there are extra artists playing. I'm very honoured and proud to say that this next crowd are on a couple of shows with us too." "And before that we heard The Pretenders who are on tour with Def Leppard and Journey on about six of seven stadium shows this coming summer. From the album Pretenders II we heard the song Message Of Love." "Proving that there's more to Chepstow than horse racing. That is a band from Wales, brand new stuff. The band are called Maddison. The song is called Sinking Like A Stone. Great stuff guys, keep it up." "Also playing with the Leps this summer, and specifically in Toronto, is this fella again an honour. This is Peter Frampton." "And before that we heard Peter Frampton from what has to be the biggest selling live album of all time Frampton Comes Alive. And he's out with the Leps this summer in Toronto. The song we heard Something's Happening." "Brand new and brilliant. Wow what a band. That is The Temperance Movement from their latest album A Deeper Cut. The song is called Love And Devotion." 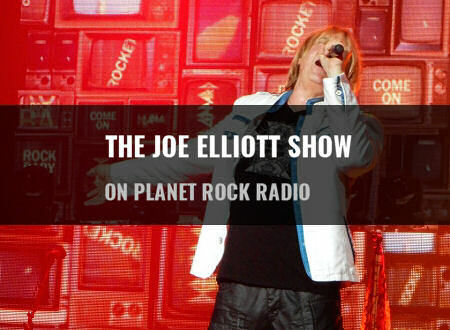 "You are listening to the Joe Elliott show on Planet Rock all the way from Los Angeles this week. It's time for a little break and when we come back, the first track from the first album I ever bought." "And before that we heard Rod Stewart. Title track from his 1971 album Every Picture Tells A Story which I bought from my local record store for the enormous fee of 2 pounds and 11 pence." "Long before he was famous, that was produced by one Mr. Robert John Mutt Lange. It is Graham Parker And The Rumour from 1977. The album Heat Treatment. The song Hotel Chambermaid." "Well if you were listening last week and you enjoyed the Jeff Lynne fest which the first half pretty much of last week's show. Well it doesn't end there folks. I have been watching the Wembley Or Bust DVD pretty much all week and it just keeps getting better and better. You have to hear this. This is Jeff Lynne's ELO." "And before that we heard Jeff Lynne's ELOfrom their latest DVD/CD Wembley Or Bust with a fantastic version of the old classic Wild West Hero." "As I mentioned earlier they're out with us for a few stadium shows in the States this summer. They're out with us for the entire British and Irish tour in December. They are Cheap Trick and from their latest album We're Alright, the deluxe version in fact, that is one of the bonus tracks. Fantastic bit of work called If You Still Want My Love." "Well ELO were well known for their orchestrated intros and this crowd weren't too bad at it either." "And before that we heard Yes from their 1987 album Big Generator with Love Will Find A Way." "Along with the likes of Blondie and the Ramones and Richard Hell and the Voidoids etc etc. They broke out of the New York scene back in 1977. Via CBGB's and they nearly took over the world, not quite. They are Television fronted by the immensely talented Mr. Tom Verlaine. From their debut album Marquee Moon that is a song called Prove It." "And that my friends all the way from Los Angeles in California is about it for this week. I shall be back with you next week at exactly the same time god willing." "Until then I'm gonna leave you with something else that's brand new. Here's a band that you've probably never heard of. They've been around for 20 odd years. They're from Canada. This is absolutely brand new from an upcoming album called 12. They are Sloan and this song is called The Day Will Be Mine. Until next week see ya!."